Back in June 2016, news broke that Google co-founder Larry Page was secretly funding two companies that were developing flying vehicles. Now, one of these firms, Kitty Hawk, is about to start testing its flying taxi service in New Zealand as part of a regulatory approval process, following an agreement with the country’s government. The New York Times reports that Kitty Hawk, which is run by Udacity CEO and Google X co-founder Sebastian Thrun, hopes to have a network of its electric, autonomous air taxis up and running in the country within three years. The planes have been operating covertly in New Zealand under a company called Zephyr Airworks. Last year, Thrun revealed the company’s hovercraft-like Flyer vehicle. More a jet ski/drone hybrid than a flying car, it was designed as a luxury toy for those who could afford one, with sales helping to fund development of the air taxi project. Kitty Hawk’s taxi, called Cora, has a wingspan of 36 feet and is powered by twelve battery-powered rotors. It has a drone-like vertical take-off and uses a rear propeller to reach up to 110 mph with a range of around 62 miles. It’s taken eight years to develop Cora, which can fly 3000 feet above ground and carry two passengers. New Zealand prime minister Jacinda Ardern is set to announce that an agreement has been reached to test Kitty Hawk’s planes as part of an official certification process. The deal follows 18 months of talks with multiple government agencies. Much like Uber and its planned UberAIR flying taxi service, Kitty Hawk is working on an app that lets users hail an aircraft. 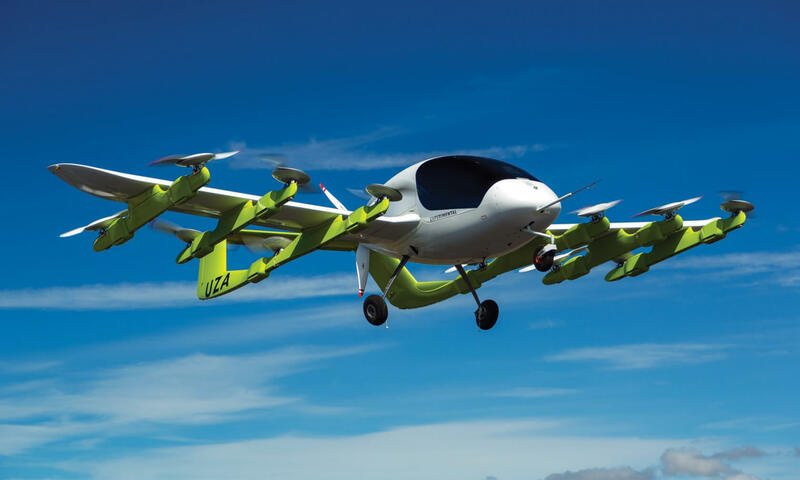 A number of companies, estimated to be at least 19, are now working on flying cars and airborne taxi services. But there are still question marks over how many people would trust them. At least Cora comes with a parachute if you suddenly need to bail out.